Carry Akroyd is a painter and printmaker whose images examine the relationship between wildlife and the farming landscape, but are just as much about colour and composition. 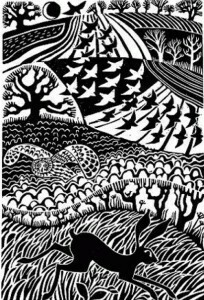 After studying for an MA in Fine Art, and illustrating two books of John Clare’s poetry (‘The Shepherds Calendar’ and ‘The Wood is Sweet’) she wrote her own book ‘natures powers & spells, Landscape Change, John Clare and Me’ which contains 150 of her images. Carry also made a series of lithographs with Curwen Studio, inspired by the poetry of John Clare, which is touring to various venues including the Royal Botanic Gardens Edinburgh, The Hay Festival, and Hereford Cathedral.